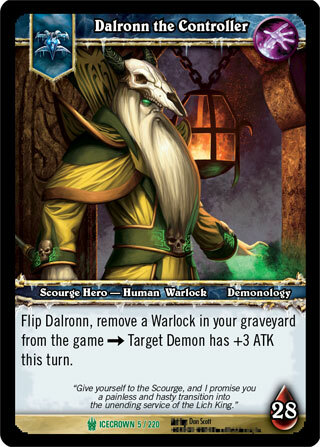 Rules: Flip Dalronn, remove a Warlock in your graveyard from the game -> Target Demon has +3 ATK this turn. ;;Deckbuilding: You can only include either [Alliance] or [Horde] cards, [Warlock] cards, [Warlock] Demonology Talents, neutral cards, and Scourge cards. You can't include cards with reputations or other text restrictions.